Example of what "Perspectives" will look like once the mural is installed under the I-45 underpass at Cullen Boulevard. The shapes, colors and icons illustrate the unique characteristics of the four surrounding communities. Students in the senior graphic design program at the University of Houston School of Art will soon be added to the growing list of artists making their mark on the city. They will join famed Houston graffiti artist Mario Enrique Figueroa Jr., artistically known as GONZO247, in a large-scale installation to beautify the Cullen Boulevard-I-45 underpass. 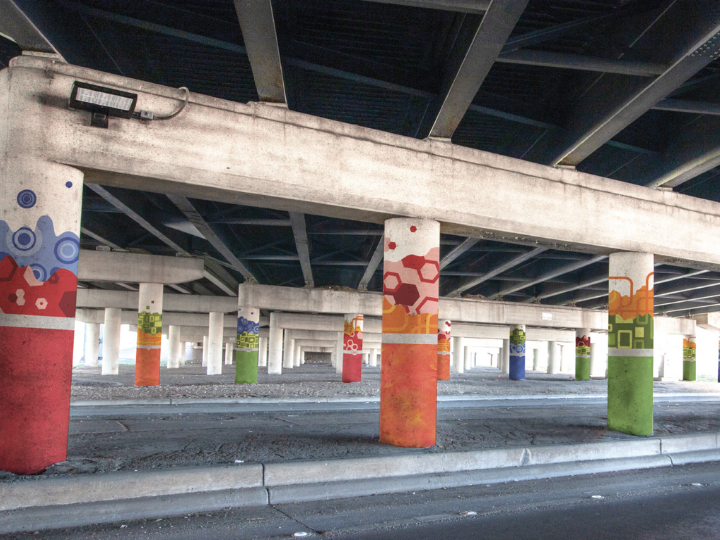 The project titled “Perspectives” will cover 22 pillars of the underpass with bright, colorful brush strokes and icons that symbolize the rich history of Houston’s Third Ward, Eastwood, EaDo and the University of Houston. Since Cullen and I-45 is a busy intersection, students were not allowed to use typography, an important element in graphic design. Instead, Gonzo encouraged them to step out of their comfort zones and rely solely on patterns and color that are big, bold and readable. 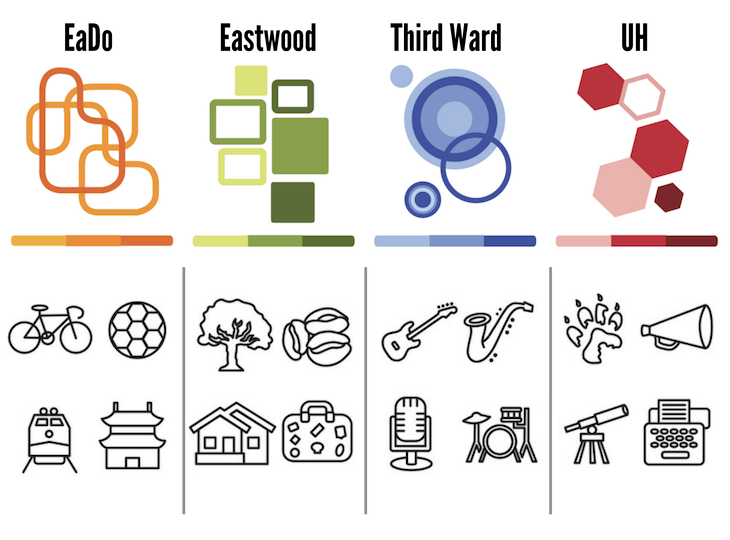 In order to bring the “Perspectives” concept to life, students researched each community to come up with the colors and icons that illustrate their unique characteristics. Gonzo’s private and public commission work, such as the famous “Houston is Inspired” mural in Downtown Houston, are vivid, colorful representations of the city and its diversity. He is the founder of Aerosol Warfare studio and The Graffiti and Street Art Museum of Texas. The installation will start in mid-April and is expected to be complete by mid-May. Several stakeholders have joined University of Houston in this effort, including Houston councilmembers Robert Gallegos and Dwight Boykins; Harris County Commissioner Rodney Ellis; Fountain Residential Partners and Caliber Living, the developer and management companies for Gateway on Cullen; community members; the East Downtown (EaDo) Management District; the Texas Department of Transportation; and Sherwin-Williams, which is providing 55 gallons of paint at no cost.